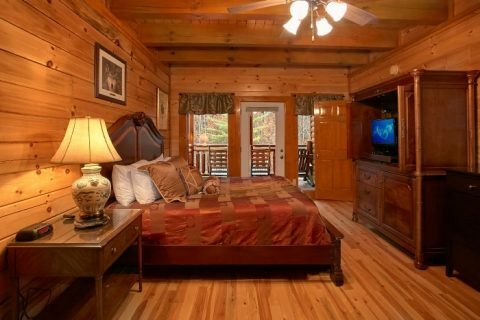 For your vacation in the Smokies, you can experience a true mountain lodge! 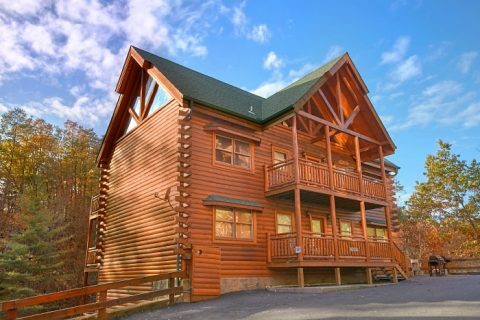 Nestled in the beautiful Black Bear Ridge Resort only minutes away from Pigeon Forge, TN! 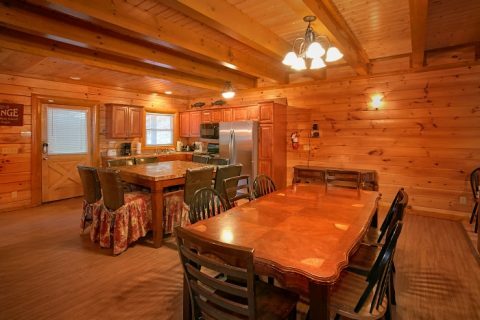 With 8 bedrooms and room for up to 28 guests, this large group cabin ensures that there's plenty of comfortable sleeping space for all of your family and friends. Better yet, you'll enjoy a terrific set of amenities during your stay. 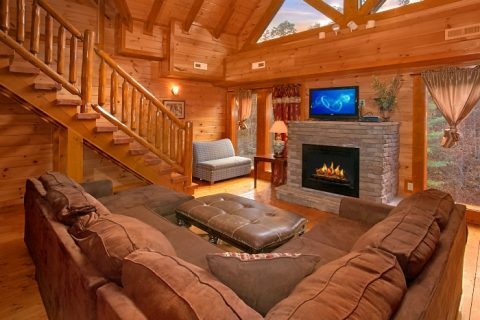 From playing billiards in the game room to watching your favorite movies in the theater room to swimming in the large indoor swimming pool, there's a lot to love about this luxury cabin for large groups! 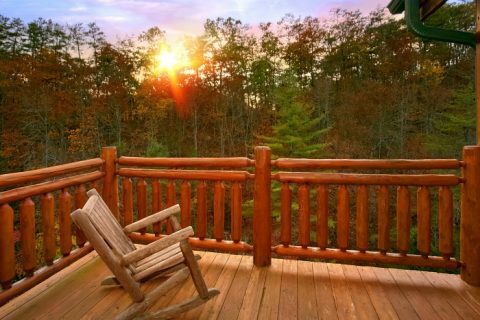 On this cabin's large deck, you'll find plenty of rocking chairs for kicking back with the people who matter most! Inside on the main level, you'll find a welcoming living room area complete with a handsome electric stacked-stone fireplace. 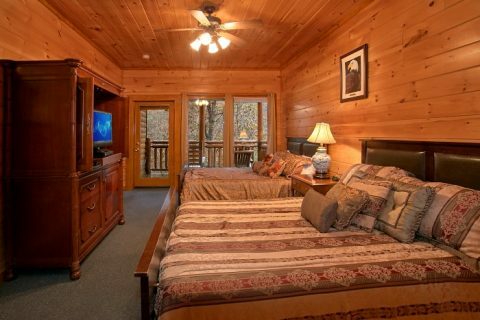 This room also comes complete with a sectional sofa, flat screen television, and a DVD player. 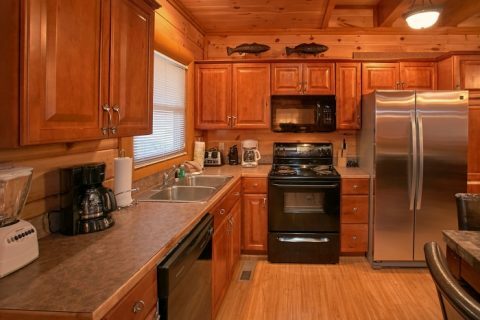 This level also houses your cabin's kitchen area and dining area with two tables and seating for up to 16. For a delicious summer cookout, you can always fire up the charcoal grill to enjoy some burgers and franks. You'll also find two comfortable private bedrooms on this floor. 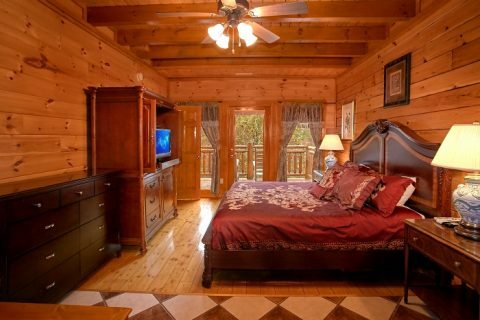 Both rooms come with a king-size bed, a flat screen television, jetted tub, and full bath. 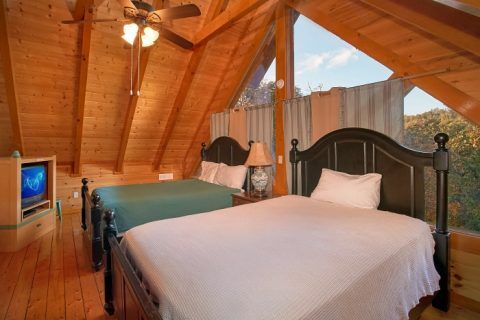 Additionally, both rooms have access to private decks, one with a hot tub and another with rocking chairs for relaxing in the pure mountain air. 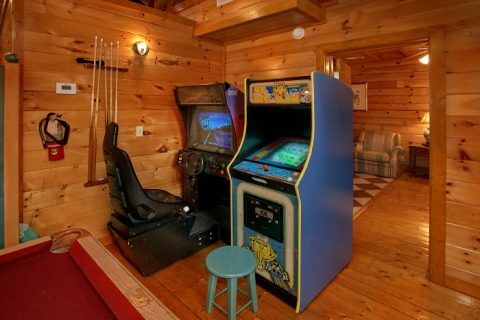 For more fun and entertainment, head upstairs to the game area. This floor has two parts. 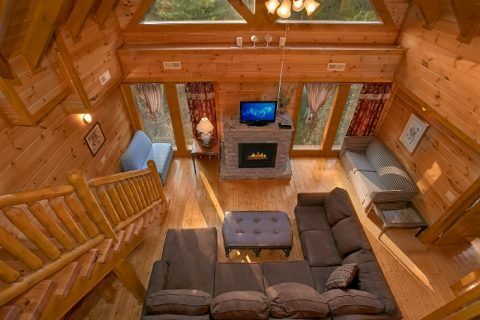 One area is an extra living room with an electric fireplace, flat screen TV, DVD player, two arcade games, and two sleeper sofas. 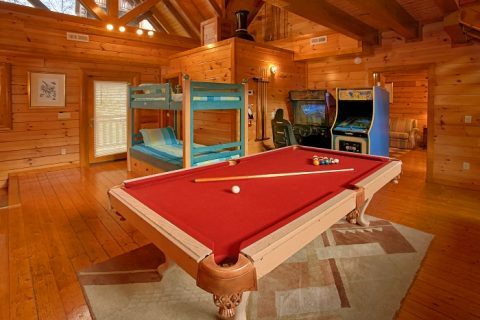 Another area is home to a pool table and a twin bunk bed with access to a full bathroom. Lastly, this level houses two private king-size bedrooms. Each room comes with a flat-screen television, in-room jetted tub, and private decks. 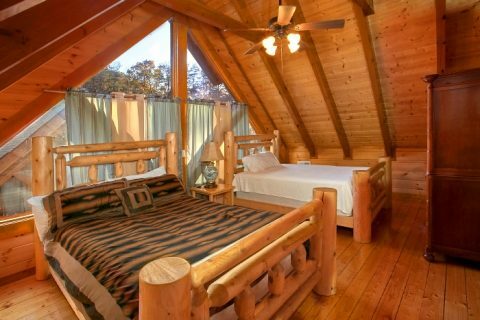 On the top floor of the cabin, a catwalk separates two more private bedrooms. 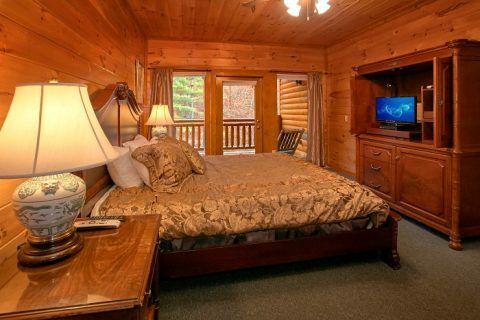 Both rooms have two queen beds and flat screen televisions, respectively. 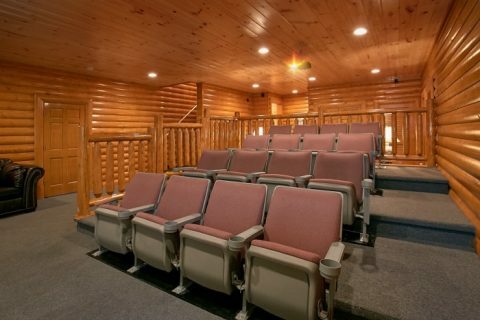 Under the main floor, you can watch your favorite movies and shows in this cabin's impressive theater room! 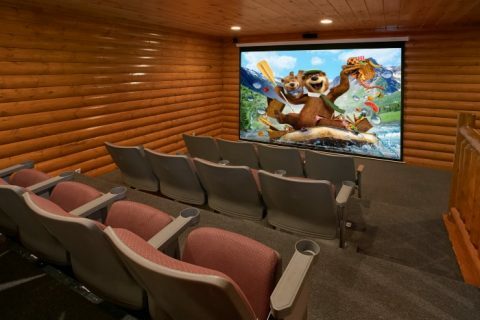 Complete with 16 theater seats, a 9 ft. screen, and a Blu-Ray DVD player, the whole group can gather together for a laid-back movie night. The bottom level is home to the sizeable, 14 FT by 18 FT indoor swimming pool. 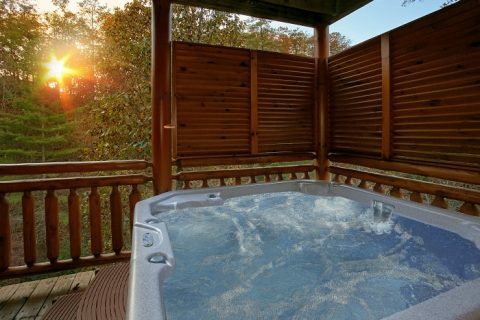 Your family is bound to have a blast splashing in this year-round pool in the comfort of your own cabin. A door from the pool area leads out to a back deck. 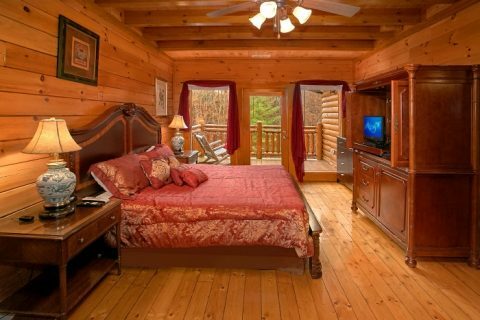 With so much comfortable sleeping space, premium amenities, and a prime location close to all the biggest attractions, this log cabin lodge offers a true luxury experience in the Great Smoky Mountains of Tennessee. 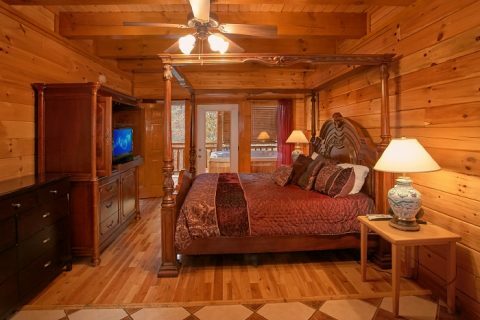 Best of all, you can reserve your large cabin in Pigeon Forge and earn a 15% discount on your stay! 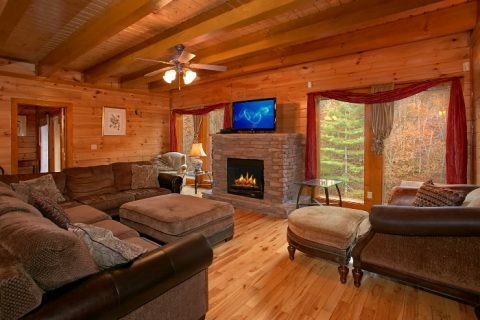 Book today and save on your group cabin complete with a theater room and an indoor swimming pool!